What is Huckleberries? Huckleberries grow wild throughout the Pacific Northwest in Oregon, Washington, Idaho and Montana. Come mid-August through mid-September adventurous berry pickers scour the sunny slopes just to pick these blue huckleberries. Huckleberries are grouped according to their growth pattern. Some bushes form clusters of berries, while others form single berries on individual stems. The thin-leaf huckleberry is the most sought-after type, according to the United States Department of Agriculture Forest Service, because of its large, sweet berries. Roll half the pastry out to fit a 9-inch pie plate. Place bottom crust in pie plate and chill for at least 20 minutes before baking. Roll out top crust and set aside. Pour mixture into unbaked pie shell. pour melted butter over berries. Add top pastry and flute edges. Cut vents for steam and place pie on a baking sheet. Bake at 400 degrees F (205 degrees C) for 15 minutes. Reduce the heat to 350 degrees F (175 degrees C) and bake until the crust is golden and the juices are bubbling, 45 to 55 minutes more. 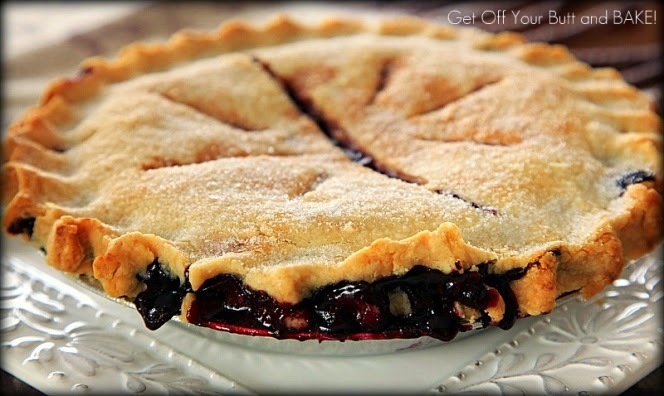 You'll need to bake the pie longer if the berries were frozen. Cool pie on wire rack.